Late last night Deandre Jordan reneged on last week’s decision to sign with the Dallas Mavericks, instead electing to resign with the Los Angeles Clippers. In the weeks and months preceding his final decision rumors swirled about feuds with Chris Paul and or Clippers management. If the Clippers start to struggle tensions could resurface and cause trouble in Clipper Country. Clearly Jordan had some reservations about resigning with his old team. Deandre’s change of heart coupled with Tyson Chandler’s departure will more than likely result in a few more tallies in the loss column for Cuban’s boys. A few more Mavericks losses could dramatically increase Jazz playoff chances. This is the most obvious reason for positivity in Jazz Nation over the indecision. Maybe even more exciting is what this reveals about our team. Unlike Deandre Jazz players enjoy being a part of our organization. I mean just look at all the players who were watching Tuesday’s Summer League Game. 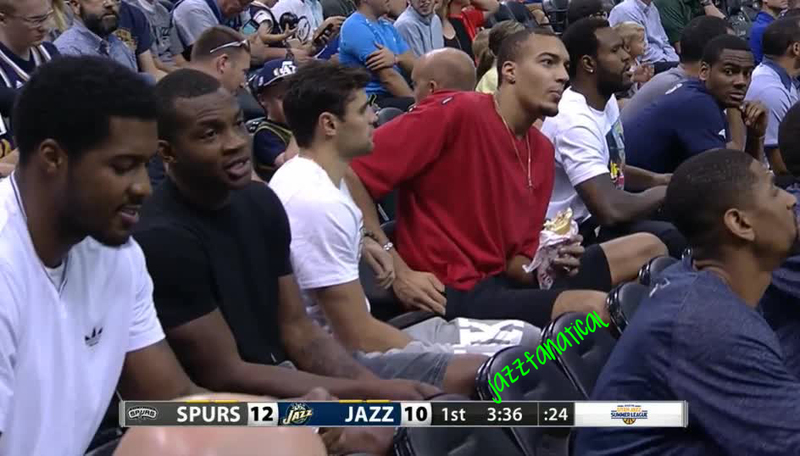 Rudy Gobert, Derrick Favors, Alec Burks and Trevor Booker were all in attendance. Utah is not the kind of place that free agents have typically thought of as a destination and traditionally the state hasn’t attracted big names but our guys want to be here. Players are working out with coaches, ironing out some wrinkles in their games, attending summer league together and Derrick Favors is even living in his new Utah home through the Summer. Though the Jazz haven’t signed any big name free agents this summer they have players who want to be in Utah. It can’t be overstated how important this could be a few years down the road when players contracts expire. The culture of the Jazz might not brought in any big time free agents but it could certainly help us retain them in the future and that is certainly something for Jazz Nation to be excited about. Stiff back court competition will yield results. The Utah Jazz starting front-court is one of the best in the league, housing three players who could be playing in the All-Star game next season. Rudy Gobert, Derrick Favors and Gordon Hayward are a formidable trio. None of these players are likely to be displaced from their starting positions. In the backcourt on the other hand no one is quite sure who will start and how the minutes will be distributed. At the shooting guard position alone there are five players who have the potential to start for the Jazz next year. Rodney Hood, Alec Burks, Elijah Milsap, Joe Ingles and Chris Johnson could all start for the Jazz though the likelihood varies on a case-by-case basis. Hood and Burkes seem to be in a two-man race but don’t be surprised if one of the three undrafteds get a shot at the starting gig. Don’t forget that most the Jazz defensive improvement last season came while Burks and Hood were injured. All three of these players were an improvement or two away from being starting caliber players at the end of last season. 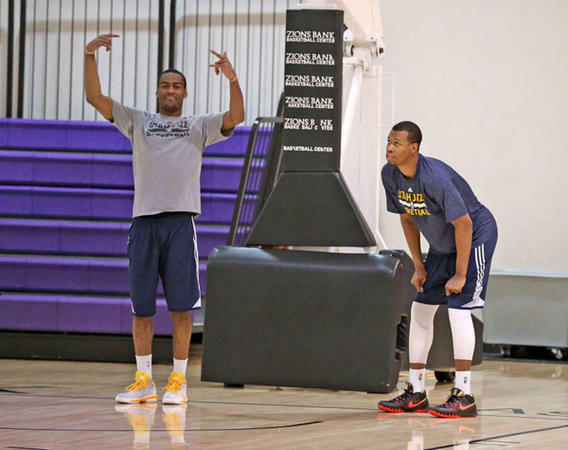 The point-guard position appears to be a little more set with Dante Exum christened heir to the throne. While I doubt that a benching of Exum will take place this season and I think it would be in the teams best interest to keep him on the court I don’t think a change is completely out of the question. Last season Trey Burke was on the Aussie fenom’s heels and there is hype coming from all three of the other point guards with a chance to be on the roster. There is reason to be excited about Bryce Cotton, Raul Neto and Olivier Hanlan. If Exum comes back healthy expect him to start and if he plays anything like he did in summer league last night prepare to be amazed and don’t expect any questions about his position in the starting line-up come October. The real competition however is at the back-up point guard position. Though he has shown flashes of brilliance, Trey Burke’s performance has been underwhelming through two seasons of NBA play. If the Jazz brass want to trade anyone I suspect it is Burke and with Cotton and Neto waiting in the wings Burke could easily lose most to all of his minutes. It is more than likely that one or two of these four will be cut and/or relegated to the D-league. Each Jazz Point guard should be adequately motivated since their play could mean the difference between being the back-up point and being out of the league. What does all this competition mean for the Jazz? It means that each player will be working their but off to produce, knowing that the next guy is on their heels and the guy in front of them is in reach. Players will have no leeway to slack off and they’ll know it. Everyone will get better and the Jazz two weakest positions from last season will improve catapulting this years Jazz team forward. Posted on July 7, 2015 July 7, 2015 Categories UncategorizedTags Alec Burks, Basketball, Bryce Cotton, Chris Johnson, competition, Dante Exum, Elijah Milsap, Jazz, Joe Ingles, NBA, Olivier Hanlan, One, Point guard, Raul Neto, Rodney Hood, Shooting guard, Summer league, Trey Burke, two, Utah, Utah Jazz, Utah Jazz Summer League, Wing1 Comment on Stiff back court competition will yield results. The last two years Dennis has traded the Jazz into the back end of the first round, picking up solid building blocks in Rudy Gobert and Rodney Hood. If the Jazz trade into the bottom of the first round once again or trade down from their number 12 spot, Virginia’s Justin Anderson is a valuable prospect that could be available. Anderson is incredibly quick and strong for his position. These physical tools combined with his 6’11” wing span and vertical athleticism give Anderson uncapped defensive potential. As a 45 percent shooter behind the three point line last year at Virginia, Anderson has a sweet stroke and good mechanics. With his size, strength and athleticism Anderson is a versatile defender who can guard positions 1 through 3 and can even guard 4’s in a pinch. He uses his physical abilities to get out in transition and catch the defense out of position. Anderson’s handle is shaky at best, which makes it hard for him to take players off the dribble. At times he uses his physical tools to make up for defensive lapses. This will become a problem in the NBA if he doesn’t improve his fundamentals. Although he was one of the best wing defenders in the country, his low steal and block rates are somewhat worrisome. However many attribute the deficiencies to Virginia’s defensive system. He was a very streaky shooter in college and only became an elite shooter this last year. If his jump-shot regresses his offensive game will be in trouble. The Jazz desperately need a player who can make open 3’s and play defense as a Bruce Bowen type player in their San Antonio-esque system, Anderson could fill this role nicely. On a team without many great athletes, Anderson would be a welcome addition. Anderson’s physical tools refined by Snyder’s defensive prowess would likely create an elite NBA defender to supplement an elite defense. With players like Gordon Hayward, Rodney Hood and Alec Burkes to focus on defenses will frequently leave Anderson open. Anderson excels at hitting open shots. Overall, Anderson brings a great deal of potential as a three and d role player (not to be confused with D and D role playing) and could become a force off the Jazz bench. At with a 6’11” wingspan and 242 lbs of basketball player, Stanley Johnson is beast physically and won’t encounter any of the strength problems that players like Dante Exum and R.J. Hunter have/ will have. With elite strength, length and quickness Johnson has unlimited defensive potential (some have compared him to Kawhi Leonard). Johnson shot well in college, shooting 37 percent from 3 in college and 44 percent on catch and shoot 3s, according to Draft Express. He also possesses great rebounding (6.5 per game), shot blocking (.5 per game) and thievery (1.5 per game). With a 34-4 record in college and four state championships Johnson is used to winning. Johnson is relentlessly competitive and is unstoppable when he gets a head of steam, going to the basket. Throughout the past season Johnson was incredibly inconsistent, for example he followed a 22 point outing in the first round of the NCAA double tournament with a 4 point game. This wasn’t his only single digit game. Johnson also had lapses on the defensive end where he was frequently caught ball-watching and over-helping. Though his shot mechanics are much improved from high school, they are still not wonderful, a low release point is a huge part of the problem. This may explain his inconsistent jump shot. Despite being one of the strongest players in basketball, Johnson struggled at the rim especially with contact. Johnson is not good at reading a defense at this point in his development and is not an accurate passer either. In the year he’s coached in Utah, Quin Snyder has proven he can teach players how to defend. This would be particularly useful in helping Johnson develop into a great defender considering his elite physical tools. Johnson wouldn’t be the only one in Swat Lake City to need help with his shooting mechanics and would benefit from the emphasis the team will likely put on shooting. With an NBA ready body Johnson could push Hood and Burkes for minutes. If his competitiveness comes out in practice he will only make them better, even if he doesn’t end up spending much time on the court. He would also give Jazz wings practice against a long, strong Kawhi Leonard-esque defender. If Johnson falls to the Jazz they’ll have another solid 3-and-D guy and potentially a third or fourth option down the road.